Although wrongs have been done to me I live in hopes. 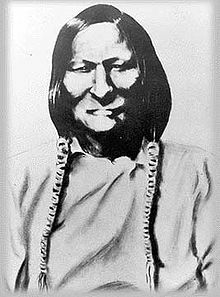 Chief Black Kettle (Cheyenne, Moke-tav-a-to) (c. 1803 – November 27, 1868) was a Cheyenne leader who unsuccessfully attempted to resist white settlement from Kansas and Colorado territories. He survived the Sand Creek Massacre in 1864 but died in the 1868 Battle of Washita River. I want you to give all these chiefs of the soldiers here to understand that we are for peace, and that we have made peace, that we may not be mistaken by them for enemies. Since they have come and cleaned out our lodges, horses, and everything else, it is hard for me to believe the white man anymore. I always feel well while I am among these friends of mine, the Witchitas, Wacoes, and affiliated bands, and I never feel afraid to go among the white men here, because I know them to be my friends also. … I come from a point on the Washita River, about one day's ride from Antelope Hills. Near me there are over one hundred lodges of my tribe, only a part of them are my followers. I have always done my best to keep my young men quiet, but some of them will not listen. When recently north of the Arkansas, some of them were fired upon, and then the war began. I have not since been able to keep my young men at home. We have come with our eyes shut, following Major Wynkoop's handful of men, like coming through the fire. All we ask is that we have peace with the whites. We want to hold you by the hand. You are our father. We have been traveling through a cloud. The sky has been dark ever since the war began. These braves who are with me are willing to do what I say. We want to take good tidings home to our people, that they may sleep in peace. I want you to give all these chiefs of the soldiers here to understand that we are for peace, and that we have made peace, that we may not be mistaken by them for enemies. I have not come here with a little wolf bark, but have come to talk plain with you. Although wrongs have been done to me I live in hopes. I have not got two hearts. … Now we are together again to make peace. My shame is as big as the earth, although I will do what my friends advise me to do. I once thought that I was the only man who persevered to be the friend of the white man, but since they have come and cleaned out our lodges, horses, and everything else, it is hard for me to believe the white man anymore. The white people can go wherever they please and they will not be disturbed by us, and I want you to let them know. This page was last edited on 8 July 2018, at 20:19.